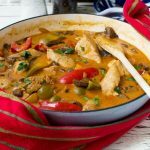 When you want to try something new for dinner but don’t want to spend hours making it, this paprika chicken is a perfect choice! I don’t know about you, but I always feel quite smug when I make a new and impressive-looking meal with a relatively small number of ingredients and in a short space of time. If I may say so without you thinking I’m boasting, this delicious paprika chicken ended up being one such meal. I only post things I’m really enthusiastic about (as you’ve no doubt noticed – you must be fed up of me saying my recipes are quick and easy this, and delicious that). 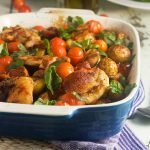 But I have to say that one-pan chicken recipes are the sorts of recipes I always feel the MOST excited about sharing with you. I mean, it’s simple really. 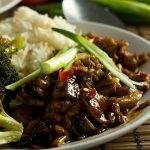 You get home from work and the last thing you feel like doing or have the energy to do is fath about with a new recipe. But if all it involves is chopping up a bit of chicken and throwing it into a pan with some veggies, chicken stock, sour cream and a few other ingredients, then we can all cope with it. Can’t we? I’ll spend a few extra minutes reading through a new recipe if I know I’m going to get something this tasty on the table within half an hour! When I’m writing about a new recipe for the blog, I always try to think about why I particularly like it so that I can sell the idea to you all too and get you excited about giving it a try. Its ultimate selling points, I suppose. 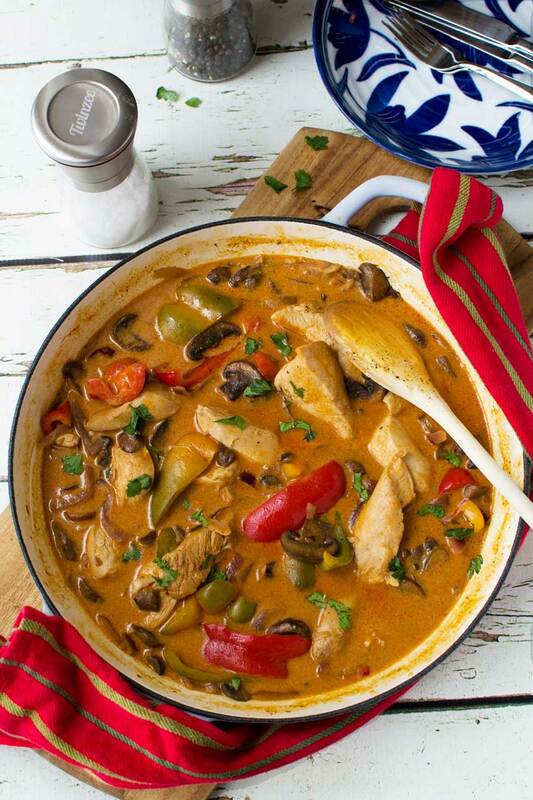 So what are the USPs of this one-pot paprika chicken? For me it’s the big chunks of juicy chicken, the smoky taste of the paprika, and (actually most of all) the vegetables. I decided to add peppers, onions and mushrooms to this, and wasn’t disappointed. 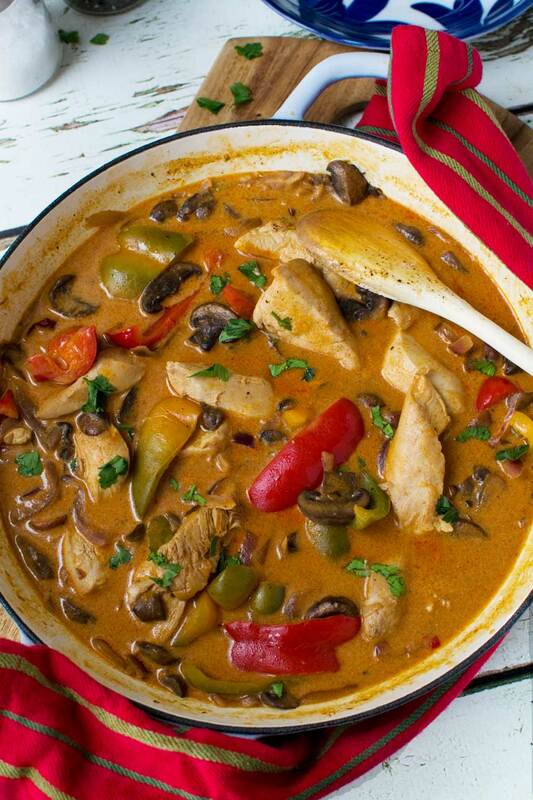 I kept the peppers in big chunks, made sure there were plenty of mushrooms, and it all worked together perfectly. But the icing on the cake, as it were, is the sour cream that you swirl in at the end. Enough said. Mmmm. This is a very ‘saucy’ recipe, so it’s perfect for serving with rice. We had our meal with brown rice, which Mr. Scrummy doesn’t really like (I force fed it to him, wicked wife that I am!). If I’m honest I’d probably prefer white rice with this too, but any kind of yummy fresh bread works well as well – maybe some of the easy flatbread I posted last week? So what’s the verdict? Have I done a good enough sales job on this for you to give it a go this week? P.S. Turning into Superwoman here. Feeding baby, typing this and drinking cappuccino in a café all at the same time. Seems like it might be the best way to get anything done around here right now! If you're lacking inspiration for something new for dinner this week, give this a go. It's something a little different, but won't be too much trouble to make. 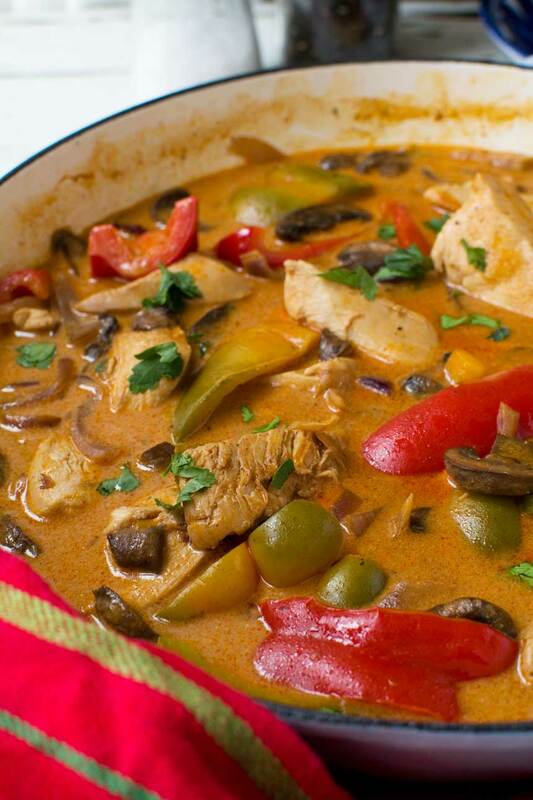 Lovely smoky, creamy chicken with bell peppers, mushrooms and onions and a lovely soured cream tang. Delicious! Brown the chicken in a little oil in a heavy-bottomed pan or saucepan* for a few minutes. Take out of the pan and set aside. Wipe out the pan with kitchen paper, add a little more oil and cook the onion gently for about 5 minutes until softened. Add the garlic and cook for a minute or two longer. Add the peppers and mushrooms and cook for another few minutes until the mushrooms begin to release their water and soften. Sprinkle over the paprika and add the tomato paste. Blend the cornflour with a bit of the chicken stock then pour it into the pan along with the rest of the chicken stock. Add the chicken back into the pan and simmer for 15 minutes with the pan lid on until the chicken is cooked through and the sauce has thickened a little. Stir in the soured cream and grind plenty of salt and pepper in to taste. Serve over rice with a sprinkle of fresh parsley, if you like. *Use a pan with a lid. Although I haven’t tried it, I think this recipe would work well with pork fillet too. Give it a try! This dish has that cooked for hours look and it’s so hearty as well. I love the addition of the sour cream at the end. I can’t wait to try this. Hi Janette. Yes, this is definitely a comfort food recipe. Hope you give it a try! This is one of my mom-food faves! Hi Chrissy! Oh of course – I bet your mom has a lot of ‘paprika’ recipes up her sleeve. Hope you are well! The way you described it, I’m sold! This chicken looks amazing! I must try it asap! Hi Mira – hope you do try it! Sold!! This is exactly the kind of thing we love to eat. Adding this to our weekday menu! Thank you, my dear! You’re so welcome! Glad you like it. 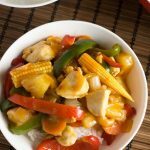 I loved this recipe and will be making it time and time again. For anyone who makes this, I followed the recipe exactly and it came out good but just a little on the plain side. It could benefit from a half a tablespoon more of tomato paste and a teaspoon of sriracha. Thanks for the honest review, Jenna! I’ll try adding some more tomato next time too.